The Company posted a Net Profit of Rs.631 crores on a revenue of Rs.3131 crores for the Financial Year 2018. 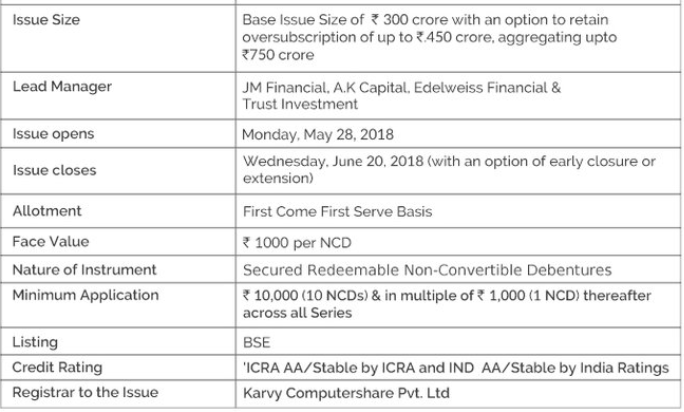 NCD is Non-Convertible Debenture. An instrument which offers a FIXED rate of INTEREST for a specified tenure. 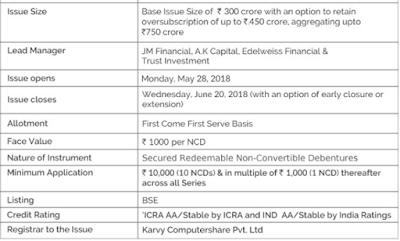 Non-Convertible Debentures do not get CONVERTED into Equity shares at a later date unlike a Convertible Debenture. Rating: ICRA AA/Stable by ICRA and IND AA/Stable by India Rating. These Ratings indicate a HIGH DEGREE OF SAFETY regarding timely servicing of payment of Interest and Principal. for 38 Months 9.25% p.a. (Annual) (Effective Yield (per annum) is 9.26%. for 5 Years 9.11% p.a. (Monthly) Effective Yield (per annum) is 9.49%. for 5 Years 9.50% p.a. (Annual) Effective Yield (per annum) is 9.49%. for 10 Years 9.34% p.a. ( Monthly) Effective Yield (per annum) is 9.74%. for 10 Years 9.75% p.a. (Annual) Effective Yield (per annum) is 9.74%. Allotment on FIRST COME FIRST SERVE basis. Company will give interest @8% on allotment money and @5% on refund amount. PLEASE NOTE, DEMAT IS NOT MANDATORY to invest in this issue. 1. The NCD is SECURED. Meaning the Debentures are BACKED by JM’s assets to fulfil the DEBT OBLIGATION. Investors looking at steady interest income for long term may consider investment in this AA/stable rated debt issue. 4. Ratings too indicate HIGH DEGREE OF SAFETY regarding timely servicing of payment of Interest and Principal. 2. With interest rates starting to go UP again, there may be better issues in future days. Please invest in the NCD in moderate portion and ensure that you do not cross your DEBT ALLOCATION. Investors are strongly advised to contact their FINANCIAL ADVISOR who, being better informed and more knowledgeable, would be in a much better position on your INDIVIDUAL portfolio and advise accordingly. This Blog and articles in this blog is for INFORMATIVE & EDUCATION purposes only. We may have vested interest in all the investments that are discussed here and our views could well be baised. You are strongly advised to contact your Financial Advisor and do your own due diligence.